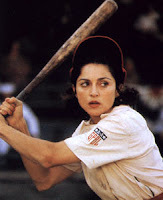 Among the prized items in radio talk show host Dan Patrick's collection is a genuine pink ladies baseball uniform worn in the movie "A League of Their Own" starring Madonna. Being a romantic kind of guy, on Valentine's Day Patrick suggested to his wife that she don the "League of Their Own" uniform for a little role-playing hanky panky. The role-playing was not successful as his wife apparently called foul. "I learned my role was to shut up and get lost," Patrick confessed to his listening audience.